Baza Protect is a zinc oxide-based barrier with dimethicone. Provides effective relief from the inflammation caused by diaper rash. All-purpose skin barrier for incontinence. For use on intact to slightly excoriated skin (light to moderate incontinence). Daily Use. Redness/ Blotchiness. Sensitive Skin. My mom is 80yrs old and has late stage Dementia. She is totally dependent and can no longer toilet herself. Her caregiver started using this product on her (at every changing) well over a year ago. Her skin has maintained it's integrity and she has had no breakdown. I highly recommend this cream for daily/reg use for anyone with bladder incontinence. stops itching. Decreases Wetness on Skin. Non-Greasy. Cost Effective. Moisturizes. Smells Great. Repels Wetness. Lightweight. A Little Goes A Long Way. Soothes Skin. 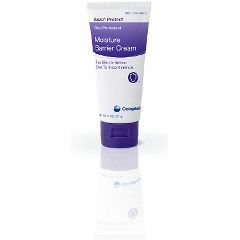 Great skin protectant against added moisture from sweating underneath a body cast. I like that it is very lightweight and non-greasy; I hardly know it's there and it can be used as often as is needed. Goes On Smoothly. Moisturizes Well. Softens Skin. Good Value. Moisturizes. Dry/Chapped Skin. Bedtime. After Shower/Bath. Daily Use. Redness/ Blotchiness. Sensitive Skin. Deep Moisturization. I ordered this touse on my Grandmother who wears adult diapers and is in a wheelchair. This product works great on days when she has redness and or dry areas under her diaper.. works great for the price..
Long Lasting. Not Greasy. Goes On Smoothly. Moisturizes Well. Softens Skin. Smells Great. Dry/Chapped Skin. Bedtime. After Shower/Bath. My mom is incontinent and I use it to protect her skin overnite & during the day. It goes on easily and washes off easily & really does a great job in protecting her skin from any rashes, redness,dryness or any skin break down from urine. I have tried many products & found this works the best. Her hospital highly recommended it and they were right & I have used it ever since. Absorbs Quickly. Goes On Smoothly. Not Greasy. Softens Skin. Moisturizes Well. I use at bedtime on my elderly mother. It works well, but does not last as long as Desitin. I alternate between the two.